Hello! Did you recently established in Finland? Well, congratulations, this is a fantastic place to live. You are here for a few months or possibly a longer time and you decided that it was the right time to learn how to play guitar or maybe to finally be serious with it. Congratulations again! Guitar lessons are the safest and the shortest way to get you where you want. 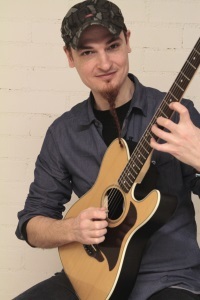 My name is Roo Chapus, I am a professional musician, entrepreneur and a guitar teacher in Helsinki. I moved in Finland in 2003 and since enjoy the life here, the beautiful landscapes and the rock culture! That’s why I’m enthusiastic about seeing you here and interested in guitar playing. I’ve helped, motivated, teach and taught hundreds of different profiles and levels guitarists from around the world. Some of them enjoy, in the privacy of their home, the satisfaction to play songs such as Hotel California, Under The Bridge, Stairway To Heaven or Fade To Black, to name a few, while others perform gigs regularly. They all share the same feeling to be at the right place with guitar. This is what matters, feeling great about yourself! Playing that cool song, not just the two first chords. Where to start with guitar and guitar lessons? If you have been playing already for a while, you might want to take your time to evaluate where to have guitar lessons in Helsinki. That’s perfectly fine and wise. Put success on your side by seeking for advices first. Prefer a local store who offers advices and competitive prices than online shops where guitars look identical and prices aren’t negotiable for sure! …and finally, find an instructor with a proven track record and traceable references. Guitar lesson’s little invest in time and money is always rewarded by the satisfaction of results. I value your time. Are you a beginner or a more experienced guitarist? What music/bands you’d like to play at guitar? Let’s see together how to get you there. It is possible to arrange an 10-15 min free appointment on Skype if you have specific questions. I have been there myself, no need to feel shy. It is my job to help you with guitar. I charge 49€ for a one to one 55 min lesson. After the first lesson, in order for me to set teaching programs and ease my book keeping, I ask my students to commit on sets of 4 lessons to be held within 3 months and agree the lesson’s cancellation policies. My teaching studio is located in Helsinki 00320, Laajasuontie 10A. But after 10 guitar lessons, I am now able to play couple of songs and understand some basic knowledge about how to read notes and tabs.